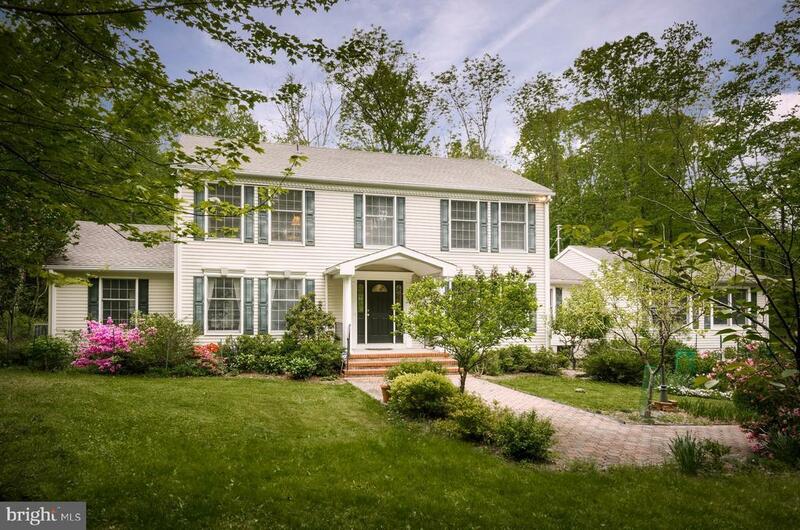 3.4 acres of natural splendor envelop this classic Colonial with complete privacy. Gorgeous views of old growth trees, flowering perennials, and peaceful lawn fill every room with peacefulness and soul; the rear of the house enjoys a perfect southwest exposure, for sunshine all year long. Hardwood floors fill a bookshelf-lined front hall which fans to large dining and living rooms, and an updated eat-in kitchen is dressed for company with granite counters, stainless appliances, and oversized glass sliders to a large deck. Wood stoves cozy up the family room and vaulted Great Room, while a sunrooms warmth comes from natural light. Tiled in a lovely blue-green, a first floor full bath works well for guests; 2 more serve 4 upstairs bedrooms, including the bright master suite with its oversized walk-in closet. A basement, 2-car garage, and outdoor shed offer more than ample storage space. Tucked away on a dead-end street surrounded by nature trails, this delightful home is only minutes from downtown Princeton. Directions: Rosedale Road to Province Line Road.